The 10 Best Cooking Classes in West Virginia! Are you a foodie at heart? Want to bring out your inner Bobby Flay? Then consider signing up for a cooking class. You can learn a new technique or create an edible work of art. Instructors include some of the best chefs and culinary teachers in the state and are happy to share their experience and love of food with you. The 10 best cooking classes in West Virginia listed below combine regularly sponsored events for the general public and career courses for those who want to see where their culinary path may lead. If you love food and would like to sharpen your culinary skills, imagine training in a state-of-the-art kitchen with some of the best chefs in the area. Cucina Luisa in Charleston, West Virginia, teaches everything from knife skills to cooking shortcuts, and you’ll learn about cooking throughout the world, including Greece, Spain, Thailand, and Vietnam. Classes typically run about four hours and everything is included. This unique venue located in Charleston, West Virginia, and in other locations around the Mountain State, offers a chance to learn how to express yourself through art and cooking classes. 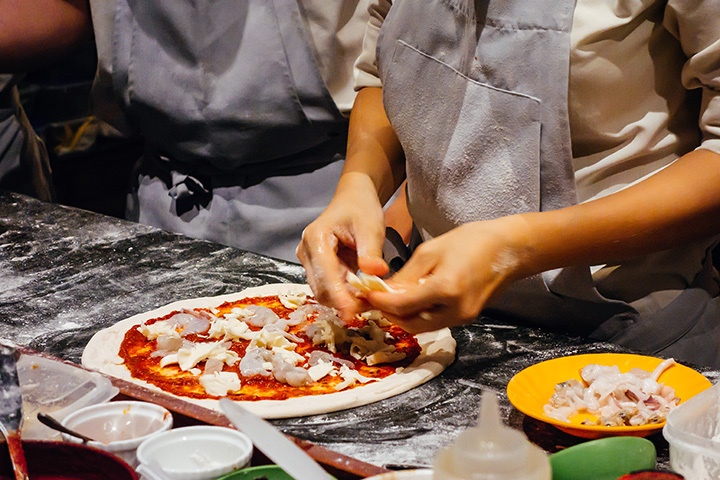 You don’t have to be a seasoned chef or even have your own materials to enroll in Uncork and Create’s culinary classes to have fun and learn a new skill. This is not just a cooking class. Participants will be walked through the creation of an edible work of art. Children aged seven to 17 are also welcome with an adult. Part of Mountwest Community & Technical College in Huntington, West Virginia, Mountwest Café is open to the public, and is the proving ground for students enrolled in Culinary Arts. You’ll learn about preparing a variety of foods, including trimming meat and poultry, and be able to create delicious soups, salads, entrees, and desserts. With a community movement toward healthy living, Hungtington, West Virginia, is the perfect place for Huntington’s Kitchen, a premier destination for learning about eating and preparing healthy natural foods without all the additives and processing that typically goes into what we eat. Originally created by Jamie Oliver’s Food Network show, “Food Revolution,” a variety of classes are offered at reasonable prices. Participants can learn knife skills, one-dish cooking, the art of using a pressure cooker, and even how to make nutritious and healthy treats for your dog. A four-day school is also offered for younger cooks between seven and 10 years of age during the summer. High school students who enroll in the Culinary Arts Program at Monongalia County Technical Education Center in Morgantown, West Virginia, will gain experience that will lead them toward their chosen career path and benefit them the rest of their lives. Students will learn about Sanitation and Safety in the Kitchen, Cooking Methods and Techniques, Tools and Equipment, and a variety of other food preparation courses. Adults can also attend during day or evening classes. When you enroll in the Culinary Arts Program offered through the James Rumsey Technical Institute in Martinsburg, West Virginia, you’ll enrolling in a school that helps build a strong foundation of Appalachian-style cooking techniques with an emphasis on wild ingredients and game. This is a unique cooking experience and former students of this program have gone one to become accomplished chefs. Offering classes since 2010 to enhance the culinary skills of novice cooks, Chef Chris Hall combines his vast experience as a professional and personal chef with his love of teaching to create an atmosphere of learning. The limited number of spots for these special classes necessitate calling to enroll, and include learning about “Famous American Regional Foods,” “Mediterranean Dishes,” “Kids in the Kitchen,” “5 Ingredients or Less,” and many others. Founded in 1994, and nestled in one of the most beautiful parts of the state, Gourmet on the Gorge in Lansing, West Virginia, offers a unique and original experience in Appalachian cooking. Their signature-style of food preparation that includes locally grown and seasonally inspired foods are delightful and can be attended by people with no skills or cooks wanting to add to their repertoire. You’ll gain confidence in your cooking ability and have fun, too. Students enrolled in the Culinary Arts Program at Carver Career & Technical Center in Charleston, West Virginia, will be taught the fundamentals of professional cooking and techniques by certified chefs. The two-year program will prepare the student for a career in the restaurant industry, and shorter, part-time classes in Baking & Pastries and other restaurant management-related courses are offered.